Diabetes is a major public health problem that is rapidly approaching epidemic proportions in the United States and worldwide (1, 2, 3). In the United States, more han 17 million persons currently have diabetes, a number that is expected to rise to 29 million by the year 2050 with a prevalence of 7.2% (4). Furthermore, the economic burden of diabetes to the US economy is monumental. In the year 2002, diabetes cost the United States an estimated $ 132 billion in medical expenditure and lost productivity (3). 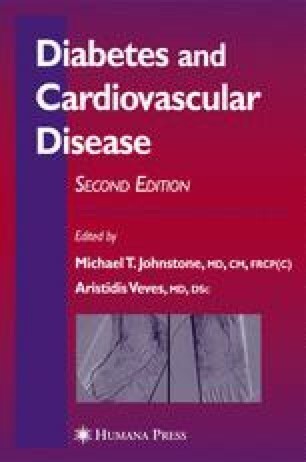 Cardiovascular disease (CVD) is by far the leading cause of death in people with diabetes accounting for up to 80% of mortality in this patient population (5, 6, 7, 8).